Art transforms, translates, transgresses, transfixes and transcends. Most importantly, art moves. It moves our ideas and our ways of seeing as it moves from one way of being to another. Tradition likewise moves as it transmits beliefs and customs across time. 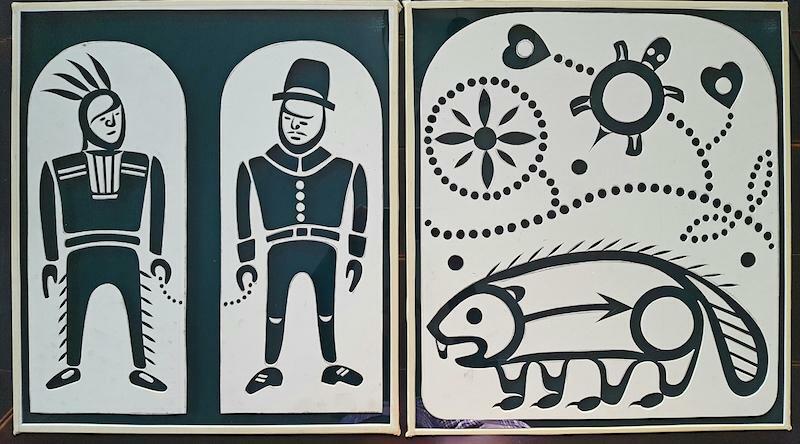 The term “traditional art” has often been applied to Native art that is strongly and recognizably related to material cultural practices established in the 19th century or earlier. This limiting interpretation does not recognize that tradition, by its very definition, is not static but is in a constant state of motion. Art in motion is not settled, static or safe. Too much change or motion can also be considered threatening or destabilizing. Is this why contemporary Native art that does not predictably hew to historical constructs is often rejected as inauthentic or viewed as a threat? Without the dynamic force of change and transformation, there is no growth in nature or culture. Native people view the concepts of tradition and transformation as being inextricably intertwined, as manifested in the work of the artists featured in Transformer: Native Art in Light and Sound, opening November 10 at the National Museum of the American Indian in New York. Native cultures have always been in motion, not frozen in amber as romantic depictions in popular culture would have you believe. Therefore, a 21st-century exhibition featuring Native American artists whose work is activated by technology should not be jarring or unexpected. On the contrary, these artists boldly demonstrate the continuity of Indigenous cultures and creativity in the digital age. In nature, motion is life. Complete stasis often leads to decline; from a biological perspective, you are either growing or you are dying.  In Ga.ni.tha (2013), a two-channel video work by filmmaker Marcella Ernest and photographer Keli Mashburn, the artists explore the idea of chaos and disorder as a source of power and purpose. 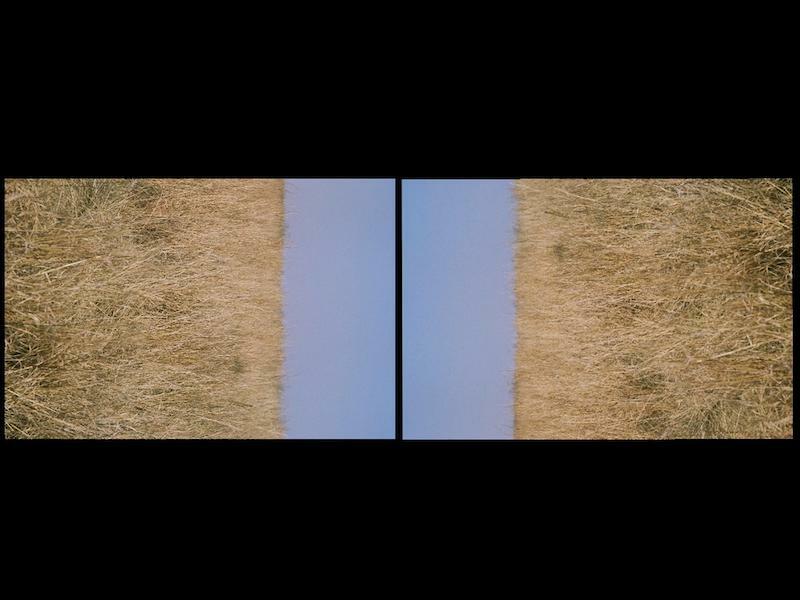 As Mashburn states, “Osages recognize fire as a precious life-giving tool/gift, and at the same time appreciate it as one of the most destructive forces in nature.” This duality became the inspiration for this work: closely cropped images of clouds and the grasslands of Oklahoma flash and appear in configurations and orientations that transform them from conventional landscapes to beautiful, disorienting patterns, while the soundscape alternates between ethereal chimes and the voice of an elder expressing thanks and gratitude. Forced to abandon notions of traditional Western landscape, the viewer experiences the title’s meaning (the Osage term for chaos and disorder). But Ga.ni.tha is not just about nature; it explores a holistic understanding of the universe that also encompasses culture. As the images cycle through a process of renewal from wildfire-scorched grassland to fresh green waves of springtime growth, there are periodic clips of dancers and an Osage bride working on a finger-woven sash to gift to her new husband’s family. It is about the metaphysical, “the microcosm of the universe created through ritual motions and the transfer of knowledge.” Understanding the nuances of Osage cosmology is not a prerequisite for a physical and emotional response. Motion is a key component to many of the works in the exhibition. Marianne Nicolson’s sculptural installation, The Harbinger of Catastrophe (2017), creates an immersive and hypnotic experience through the use of light, which ebbs and flows up and down the gallery walls, projected from her glass sculptural work. Jon Corbett’s video work, Four Generations (2015), is in constant motion as it builds “beaded” images with computergenerated pixels. 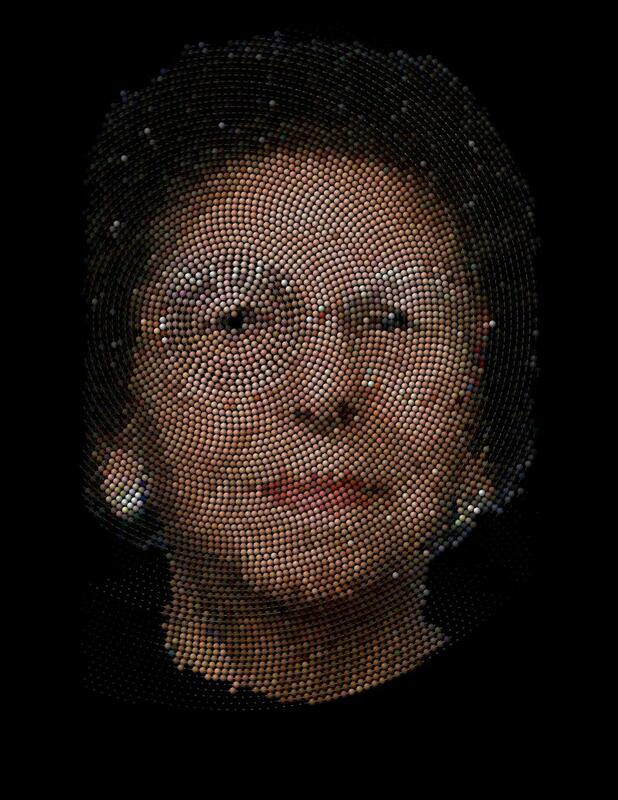 The work was created through a computer program that translates photographs of his family and community members into portraits built one “bead” at a time in a slow spiral. The movement in Raven Chacon’s Still Life, #3 (2015) is more subtle. A multi-sensory exploration of belief and the understanding of the Diné creation story, this installation is rooted in our inception within a misty, undefined place followed by a journey through four distinct worlds, each defined by light and color. Retold for generations through the spoken word (although numerous anthropologists have tried to capture it in writing), the story is, at its core, one of continual movement by our Diné ancestors from one world to another. 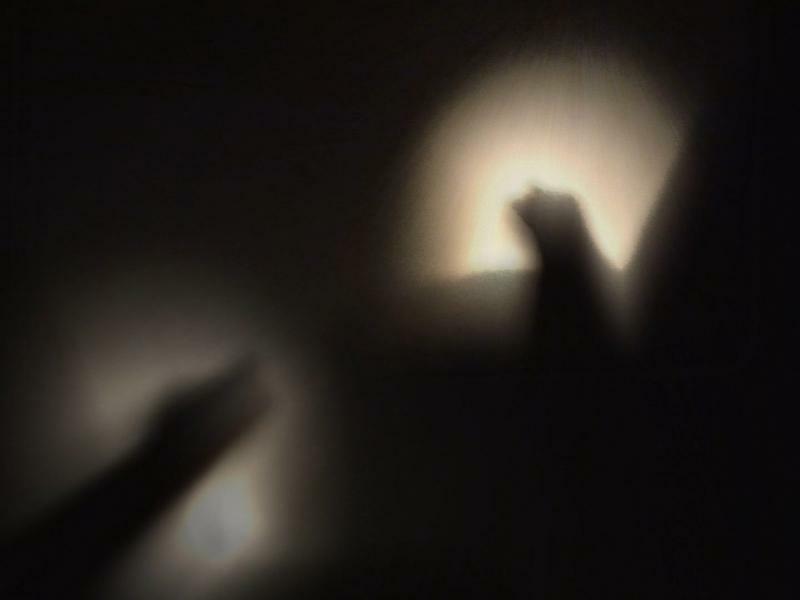 The concept of movement and story possessing a physical presence is embodied in Chacon’s use of sound. Using a row of analog speakers, he projects a female voice reciting excerpts of the Diné creation story in the Diné language. 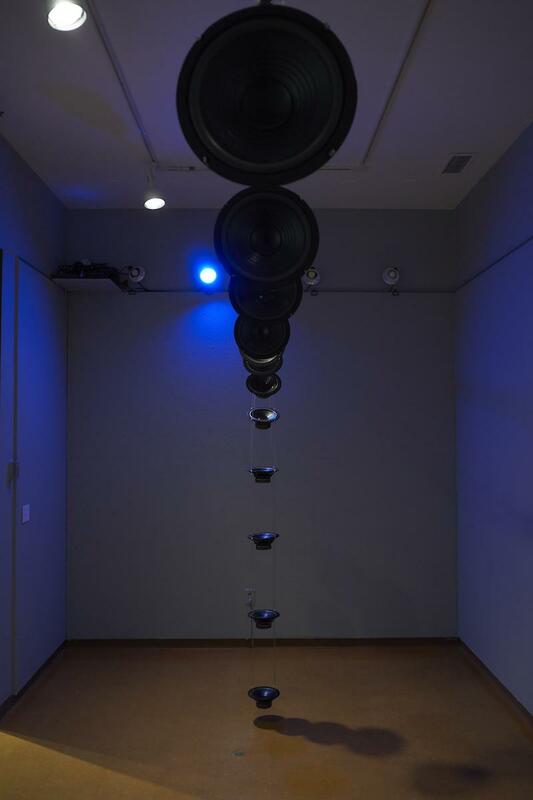 The voice palpably moves, traveling up and over the line of suspended speakers. 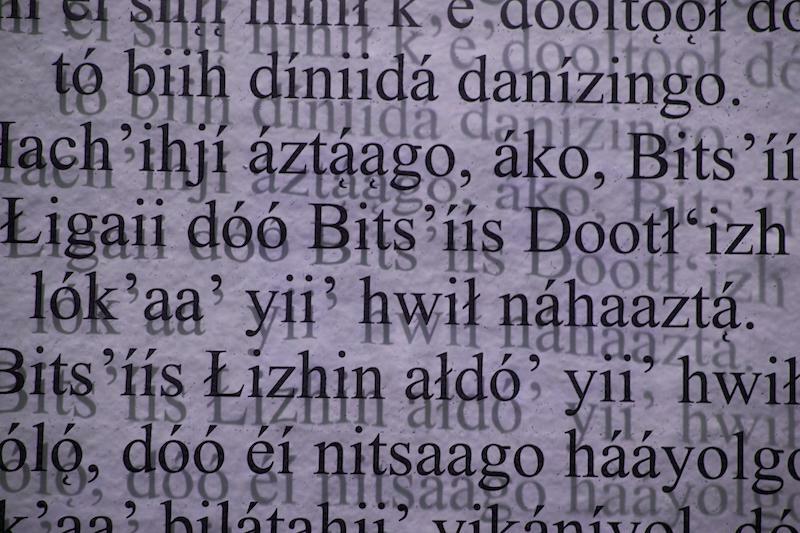 Excerpts of the story, which alternate between Diné and English, are printed on translucent text panels that are positioned so the words appear to float through time and over the gallery walls. This visual effect is enhanced by the glowing light in the gallery, which slowly shifts through the four sacred colors – from white (dawn) to blue (midday) to yellow (dusk) to black/red (night) – casting shadows of the text onto the wall. 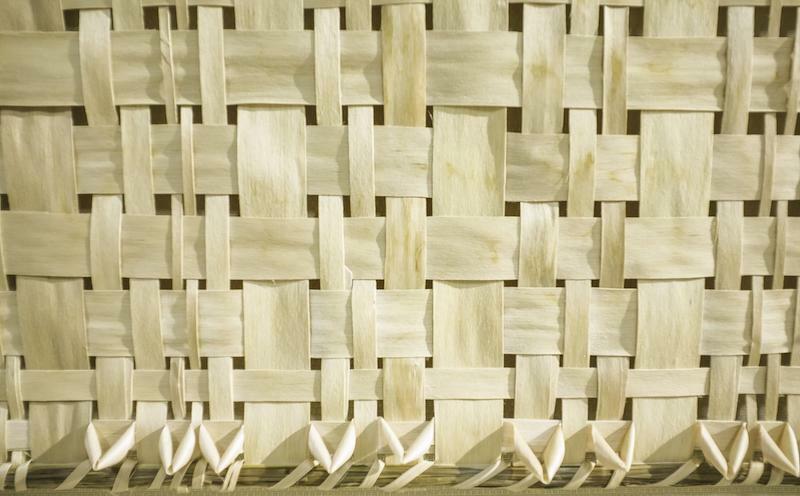 Home and community figure prominently in any work that explores tradition. 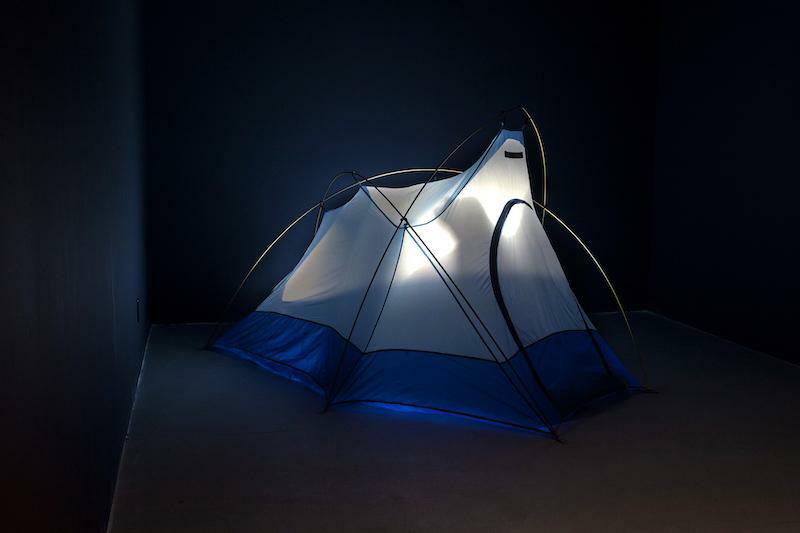 In his installation Aosamia’jij – Too Much Too Little (2017), Jordan Bennett honors his homeland in Newfoundland through the act of recovering stories and narratives. 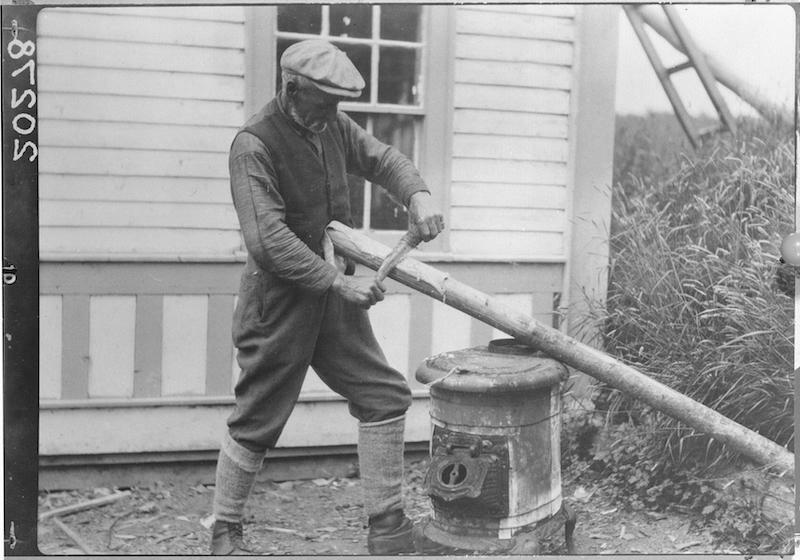 Inspired by photographs of Joe “Amite” Jeddore, a member of the Mi’kmaq community living on Samiajij Miawpukek Reserve (Conne River) in the 1930s, Bennett’s work combines stories and voices of Jeddore family descendants with atmospheric recordings collected at the rural locations captured in the photographs. A series of speakers enrobed in subtly carved wood housing with grills woven with split black ash echoes Mi’kmaq basketry traditions. The photographs themselves are transformed into living culture, overriding their original purpose as anthropological documentation. Although you can see the original photographs in the installation, Bennett’s speakers, transformed into large sculptural forms, supersede the images; suspended against a brilliant pink wall, they are a commanding presence. Basketry is not often associated with such an artificial hue, but the choice is not incongruous; Mi’kmaq quillwork was dyed bright synthetic colors but the dyes have faded and all but disappeared on historic examples. Kevin McKenzie’s choice of materials might also seem anomalous for an artist looking at belief and tradition; his work is inherently contradictory. In the Native world, beliefs are not limited to Indigenous world views. The imposition and adoption of Christianity among Native people is longstanding and raises thorny questions about the co-existence of such different belief systems. Father, Son and Holy Ghost (2015) reveals some of these tensions. 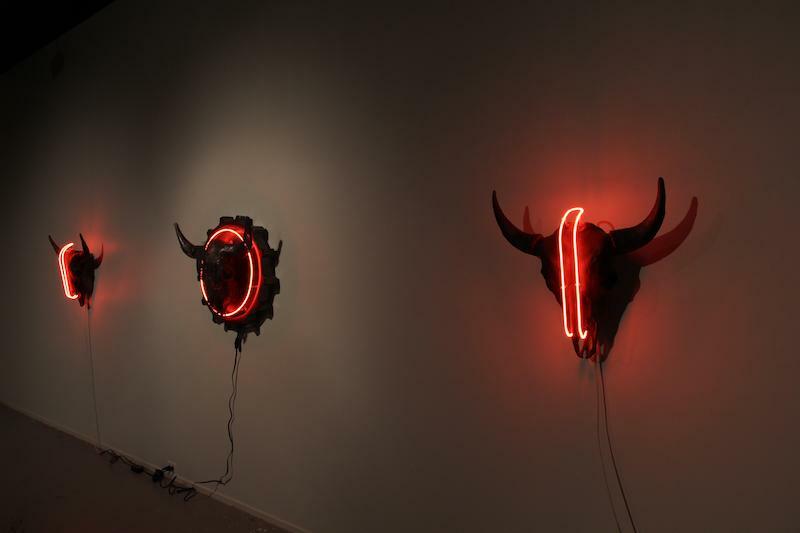 These three buffalo skulls, cast in acrylic and polyurethane, are illuminated by orange neon lights that create the appearance of a meditative chapel. The reverential treatment of the buffalo, long venerated by tribes on the Great Plains whose existence for centuries depended on the hunting of these herd animals, contrasts with McKenzie’s choice of materials. The fabricated, artificial skulls and the secular associations of neon, identified primarily with advertising and the unsavory elements of urban nightlife, complicate the interpretation of this work as creating a sanctified space. As he states, “this is where the past confronts the present, [through] the enigmatic crystalline buffalo skull.” Let us also not forget how the commercial image of the buffalo skull, often with feathers, has evolved into a cheesy representation of Indian spirituality on innumerous black T-shirts and in Western decor. The power of Native art that uses technological and experimental media is the power to move and excite our thinking about what Native art can be. The inspiration for this exhibition was my first encounter with Nicholas Galanin’s Tsu Heidei Shugaxtutaan 1 and 2 (2006) at a gallery in New York City in 2008. Galanin has always pushed the boundaries of expression and tradition through many types of media, but perhaps never as profoundly as with this memorable and powerful work. The grainy videos of two dancers improvising to music surprises and challenges us to rethink our ideas about tradition and cultural responsibility. The work was unexpected and jarring, yet also energizing. That rush of excitement stayed with me. Over the intervening years, Tsu Heidei Shugaxtutaan has been exhibited and published throughout the United States and internationally. Despite its relative simplicity in concept and execution, it has been foundational in the field of Native art and the possibilities of new electronic technologies. Although Tsu Heidei Shugaxtutaan is a recording, every time that it plays in a gallery it is performed anew. The lights go up, the music begins and the dancer responds. As a time-based media work it is also ephemeral. It doesn’t exist as a physical object but lives as a collection of data on a drive, waiting to be awoken and performed for an audience. Without electricity or an observer, it ceases to exist. In this sense, it shares an affinity with the performative nature of storytelling, ceremony and performance that existed in Native communities long before art galleries or museums attempted to preserve the material culture of North America. Each work in Transformer is both participatory and performative, requiring us as visitors in the physical space to truly understand and encounter the work. By the transformation of electricity into art, each of these artists propels us forward in our thinking about what Native art is and what it can be. Kathleen Ash-Milby (Navajo) is an associate curator at the National Museum of the American Indian – New York.